Visiting the Frida Kahlo Museum in the Coyoacan neighborhood of Mexico City has been on my wish list for many years. When I made my first solo trip to Mexico City in November it was one of the first museums I visited. I took the metro from La Condesa neighborhood to the Coyoacan stop (Line 3 – light green is the color code). If you do not want to take the metro you can take a taxi or use a ride-sharing app for transport to the museum. 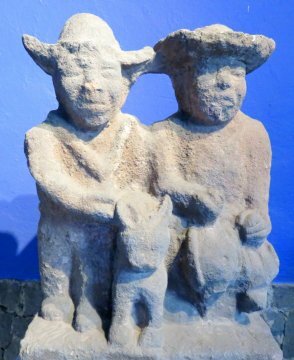 Do yourself a favor and bring some comfortable walking shoes so you can enjoy walking around the Coyoacan neighborhood when you visit the museum. Bringing a printed Google map of the area is how I could find my way without having to pull out a guide book. The walk from the metro to Frida Kahlo Museum is about 15 minutes. If you need help finding the museum, just ask anyone “donde esta la casa azul?” (where is the blue house?). With sun shining bright and a small lineup to enter the museum I opted to visit a street vendor selling fresh coconut water first. 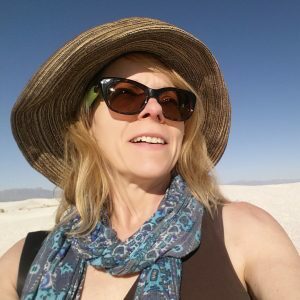 I was introduced to fresh coconut water in Rio de Janeiro walking along the Copacabana beach and was hooked immediately. If you ever need an energy boost, coconut water is a great natural remedy. 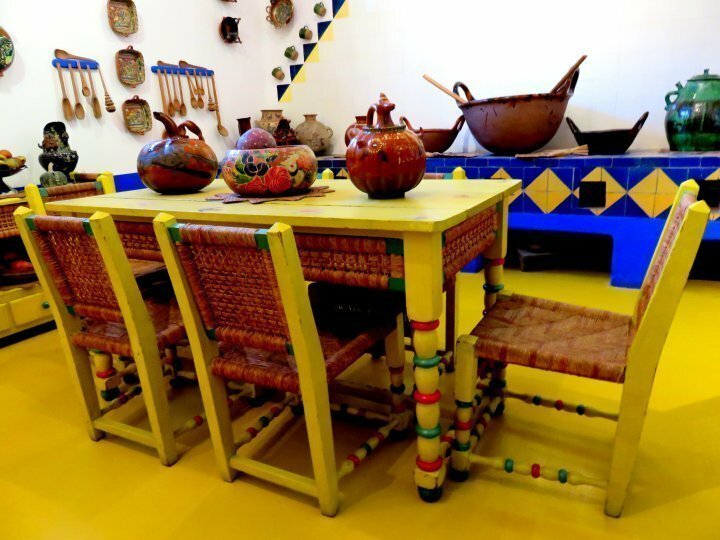 Entry to the Frida Kahlo Museum costs 200 pesos from Tuesday to Friday and 220 pesos Saturday and Sunday (rates as of March 2018). Extra fee for permission to take photographs without flash. See full price list at the end of this article, along with a link to purchase tickets online. Walking into the courtyard I was greeted with the brilliant blue of the walls. The house is known as La Casa Azul – The Blue House. 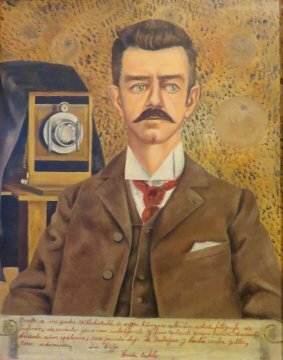 Entering the first room there were early works by Frida Kahlo including a portrait of her father Guillermo Kahlo who was a photographer. The watermelon painting is one I remember from the 2002 movie Frida, starring Salma Hayek. 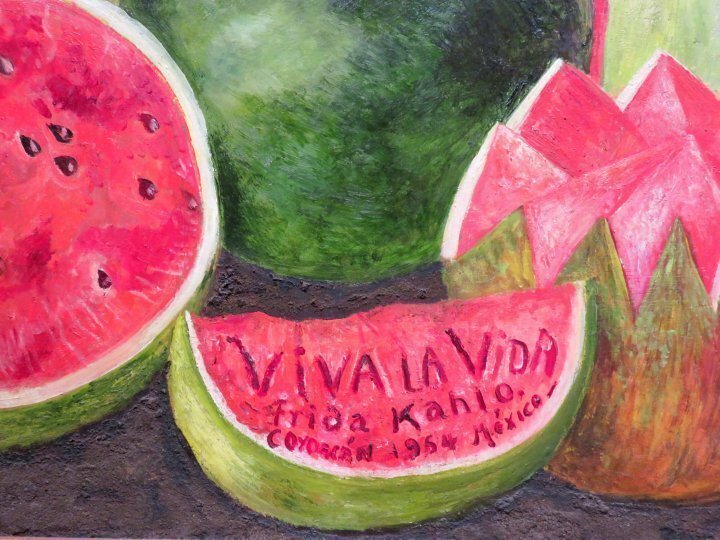 Note the words within the watermelon, on Frida Kahlo’s last painting she added the words Viva la vida Frida Kahlo Coyoacan 1954 Mexico. Viva la vida translates to Live the Life. Did she realize the end of her life was near? Frida Kahlo was an artist as well as art collector. In the second room there was an excellent display of the ex-votos Frida had collected over the years. 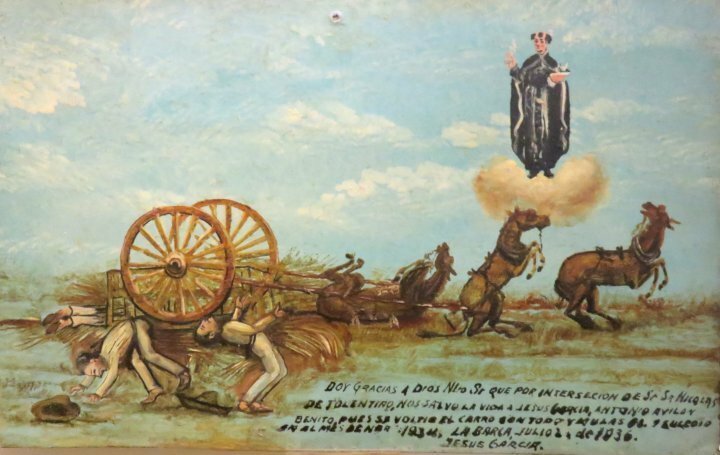 Ex-votos are Mexican folk art paintings which depict everyday life in Mexico. Ex-voto is a Latin expression meaning from a vow. The paintings are offerings made to the Virgin Mary, Jesus, or various saints in order to thank them for assistance in times of need. 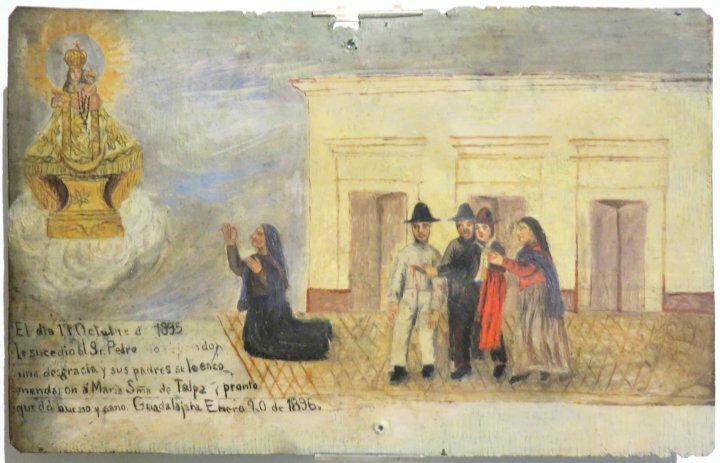 Traditionally ex-votos were painted on tin by anonymous folk artists, and include a short narrative of the event at the bottom of the painting. Frida Kahlo’s collection of ex-voto paintings dates from 1842 – 1934. There are several painting by Frida Kahlo’s spouse Diego Rivera who is famous for his murals. 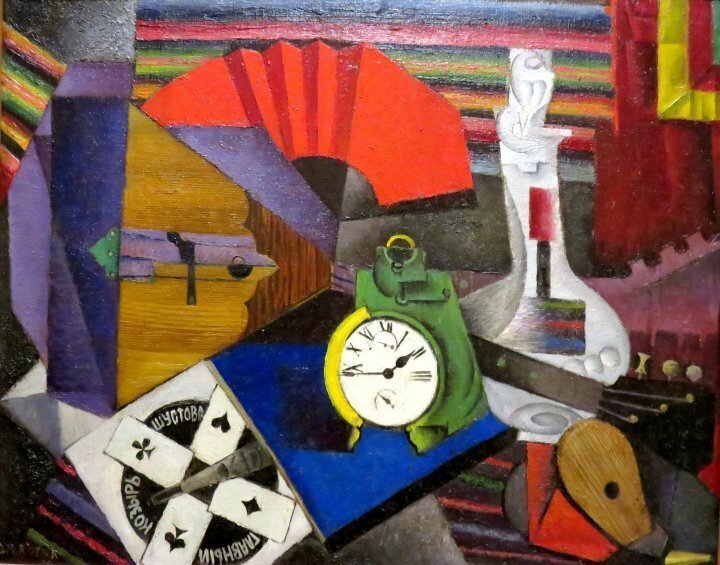 I enjoyed viewing his cubist style paintings created between 1914 and 1916. I loved the bright blue and yellow kitchen with beautiful ceramic vessels on display throughout. 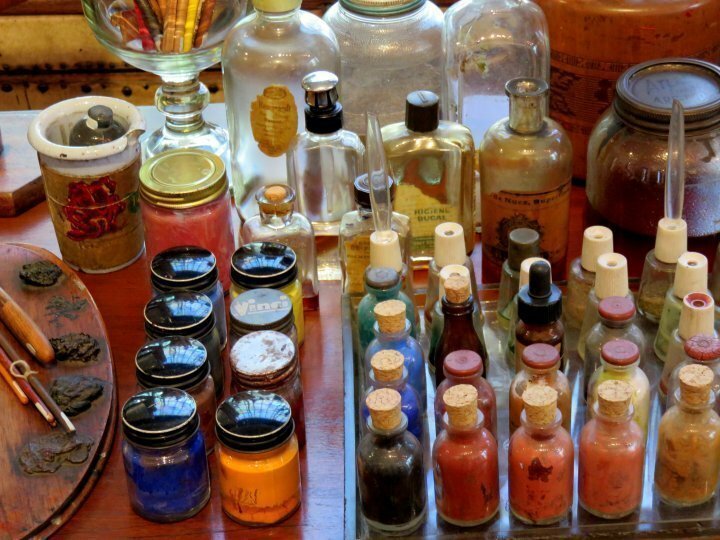 Viewing the upstairs studios of Diego Rivera and Frida Kahlo you will see Frida’s art materials, exactly as she left them. 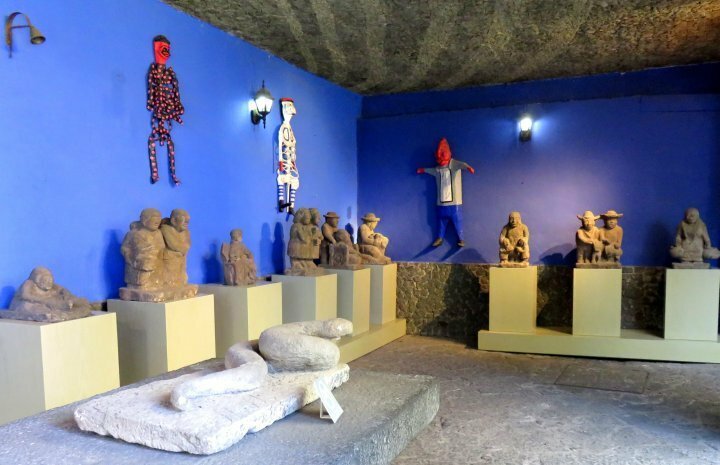 Walking down the stairs to the courtyard there is a covered patio with a collection of work by the artist Mardonio Magaña, a self-taught sculptor from Guanajuato. 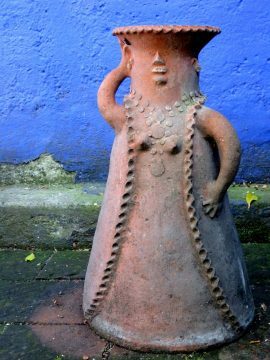 In the large courtyard there are several sculptures from the collection of Frida Kahlo and Diego Rivera. I sat outside and enjoyed a coffee and a slice of chocolate cake from the café. In addition, when I visited in November the museum featured a temporary exhibit of Frida’s clothing, accessible from the courtyard. 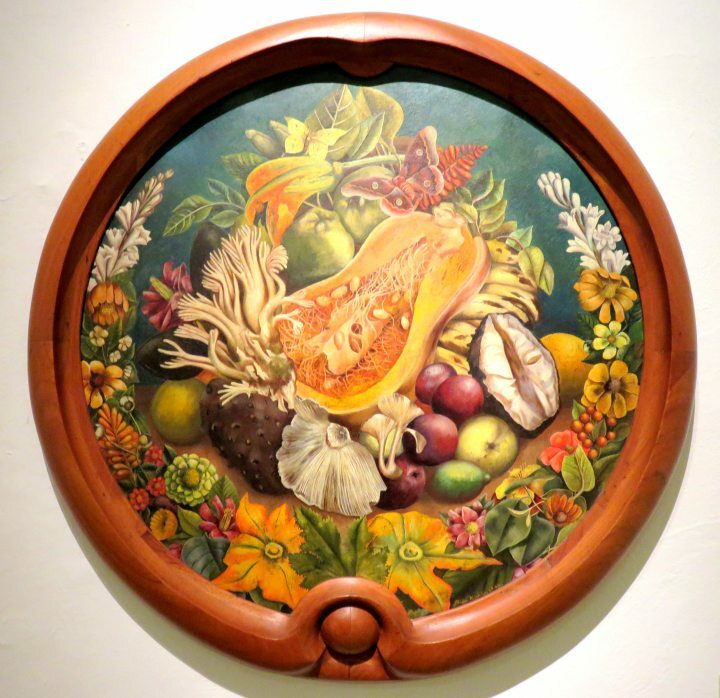 I hope you enjoyed this virtual visit to the Frida Kahlo Museum in Mexico City. Note the rates are higher on Saturday and Sunday. There is an extra fee for those who want to take photos (without flash) in the museum. The rate is around 30 pesos for the photography permit. My husband, daughter and I went to Mexico City in 2005. 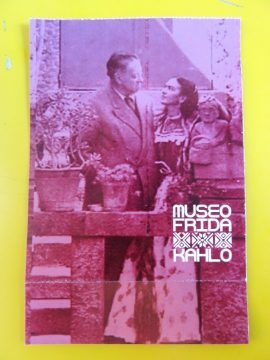 One of the most memorable ventures there was the Frida Kahlo Museum. You mentioned taking the train at La Condesa. We stayed in the Condesa neighborhood, we loved it. Thank you for bringing me back there today. Thank you for your comment Brenda. 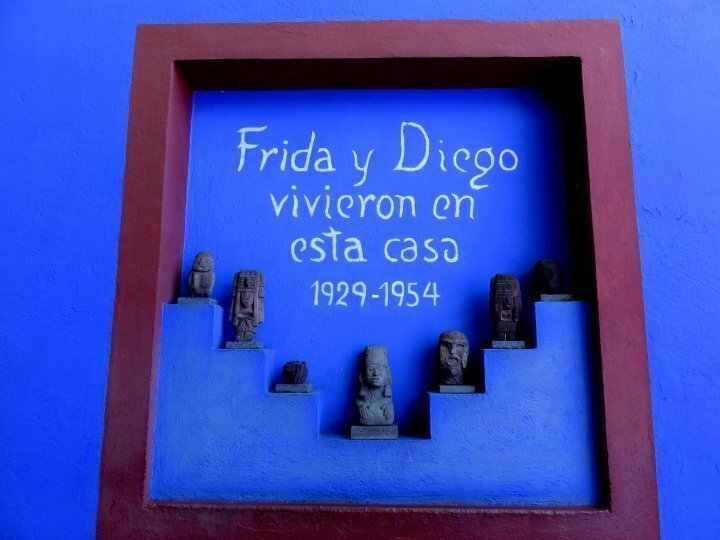 I’m happy that you have fond memories of visiting the Frida Kahlo Museum too! La Condesa neighborhood was wonderful, I really enjoyed walking around early mornings and in the evenings as well, always felt safe. Happy travels!